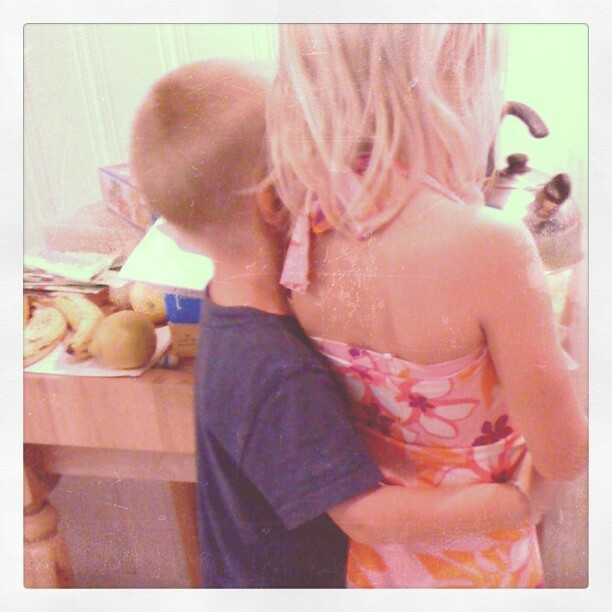 "I'm just holding her so she doesn't fall off..." 3 yr old Chase on why he stood for at least five minutes with his arm around his sister Ella (5) on our recent weekend at the beach. I was cooking breakfast and they were supervising on the kitchen stool. 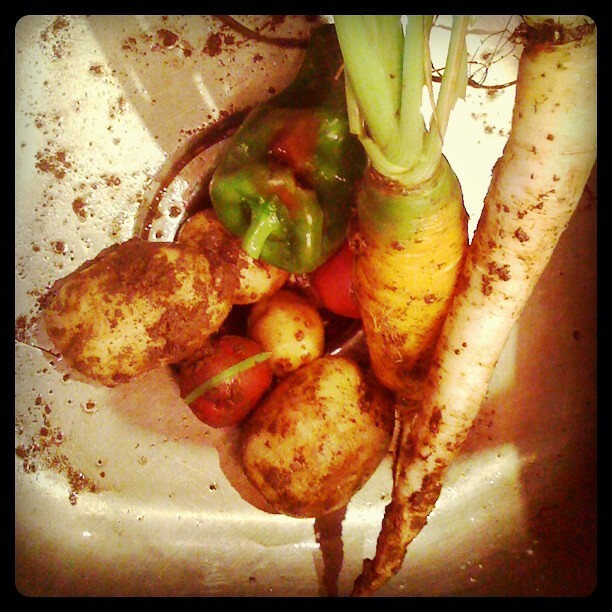 Veggies from the garden for the green curry dish we ate (and liked much) one night. I can't understand it. 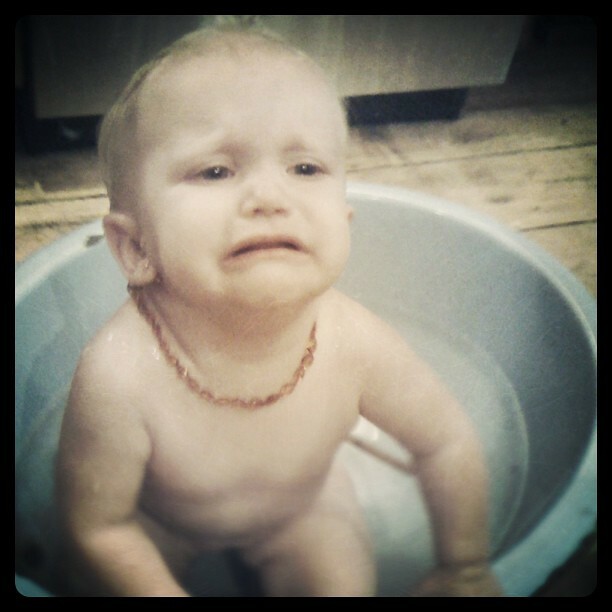 We've tried warm baths, cool baths to try to trick her into thinking it is a wading pool, baths in the sink, baths in a baby tub, baths in the enamel bath... nothing but misery. Oh-so-sad misery, clawing and clammering her way out. All we've found is she hates baths worse with bubbles. Put her in a lake, stream, or ocean and she's happy as a clam. I think perhaps she needs a moving water feature installed. Tough luck kiddo. Dinner: Homemade Dutch sausage, Italian style swiss chard greens (with cheese and hot pepper and salami), and beets with balsamic and fennel. It was good. My friend Sarah gave me a vintage pallet. 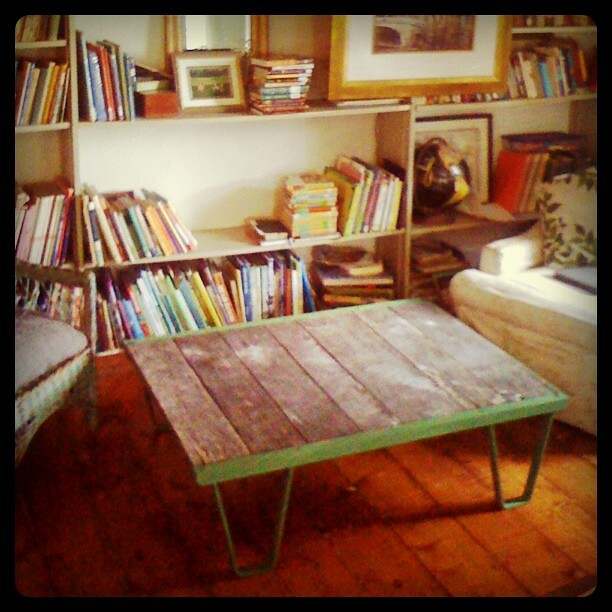 I love it as our new coffee table and the kids can't destroy it. I think there is some wisdom to decorating with an industrial spin, as is now popular! 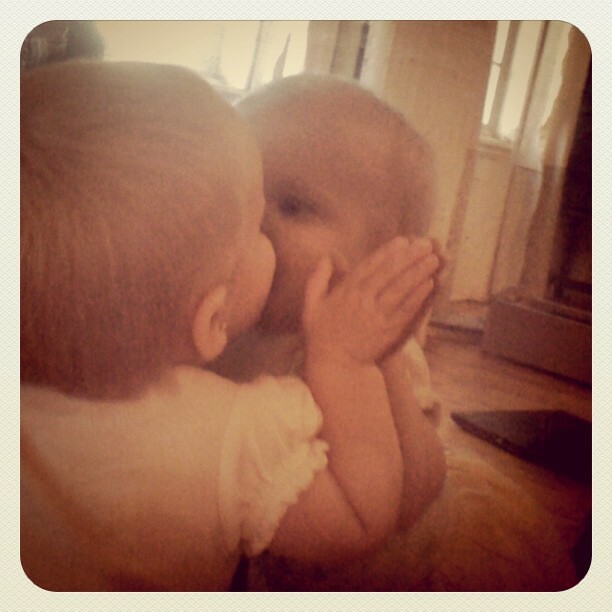 Kissing the other baby in the mirror. How about you. Do you take many photos with your phone? Poor bath hating baby- she looks awfully cute though! I must know: where are you finding sausage and hot dog recipes? I've been itching to make our own sausage for years, but I'm never sure which recipes are good to try, I hate the waste of trial and error. My husband and son often take pictures with the phone. 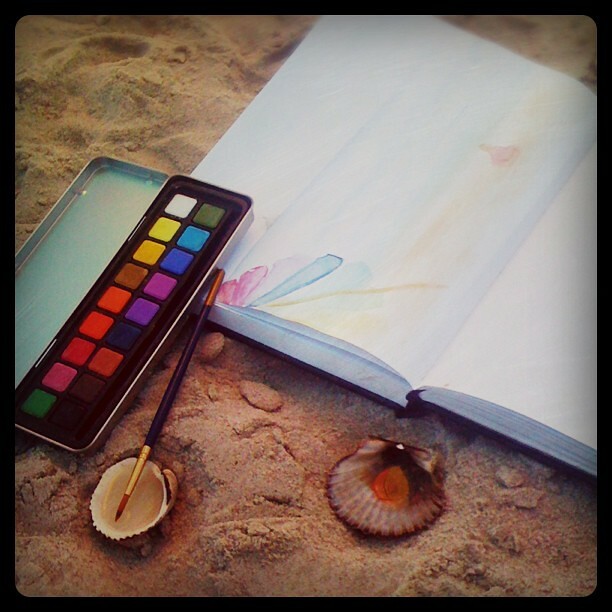 Compliments for your photos. Girl before the mirror, and bath are very nice. And ... 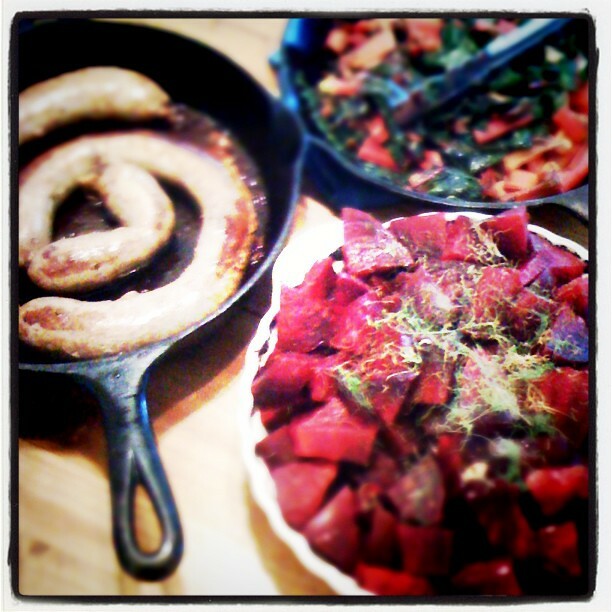 I would eat homemade Dutch sausage ( in our langiage: worst)! nice! I love the photos! 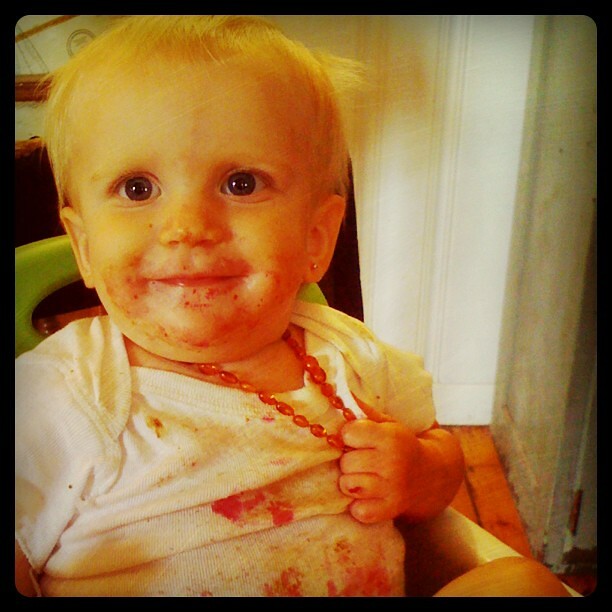 That is one cut baby - whether in a mirror, covered in beet juice, or in a much-hated bath tub! Bonnie, one of best friends and her husband don't have cell phones either.... The sausage recipe came from an old country cook book, I can post the recipe along with the hotdog one. We have liked both recipes. Sean found the hotdog one online on a kosher site, I believe. Jedidja, when we traveled in Germany, we ate many good worsts from roadside stands! Sarah, this is the first time I've used a teething necklace, after reading about it. I always thought is was silly or new-agey perhaps. But Addie is calmer, she likes to chew on it too and so I think it does help ease her pain. I read that amber has natural oils that are analgesic (in case anyone is wondering). Thanks, Anne! We think she's cuteness too.